How about a hot, juicy cheeseburger on your next transcon flight? In economy class at that? 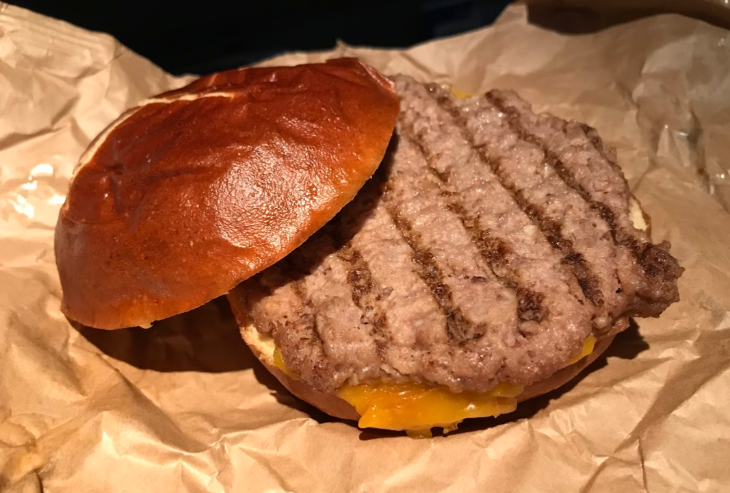 United introduced a new $12 cheeseburger option to its buy-on-board menu in January, and it seems to be taking off. UPDATE! 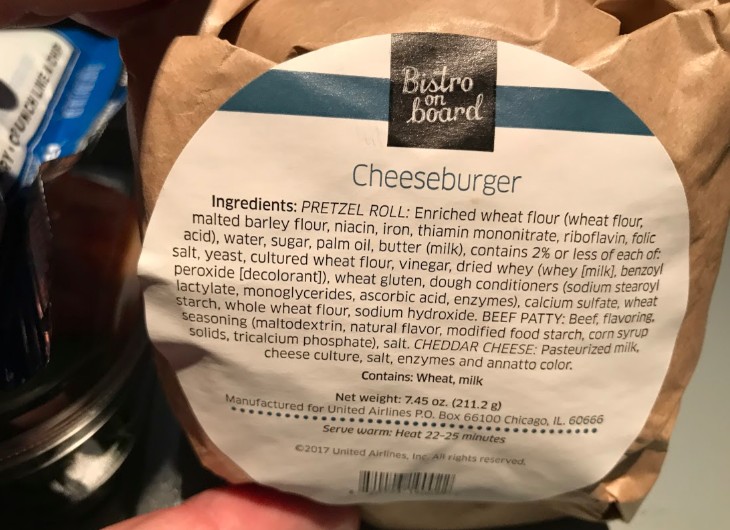 In Nov 2017, United introduced a new smoked gouda cheeseburger to replace the one mentioned in this post. Read all about that burger here. 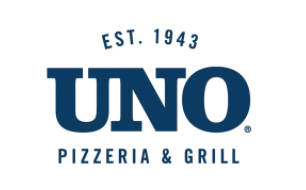 United spokesperson Jonathan Guerin told TravelSkills that the cheeseburger is now one of the most popular Bistro on Board items, with the airline now serving more than 2,000 per day. The carrier serves the cheeseburger on most North American flights longer than 3.5 hours. 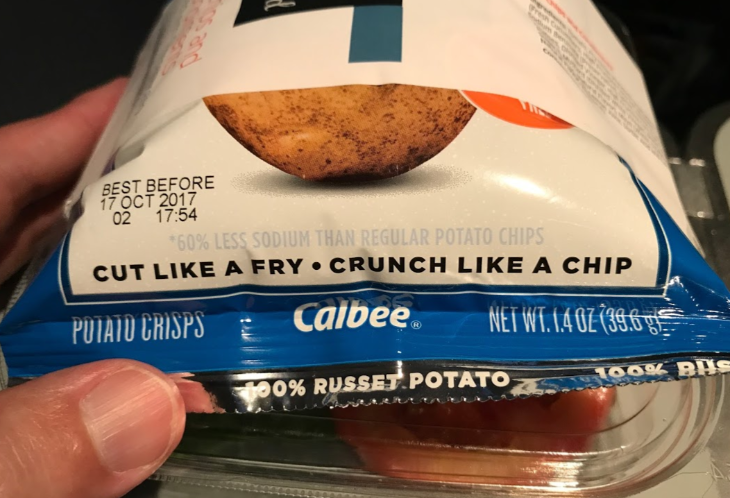 I describe it as surprisingly good and very filling. And from what I’ve heard and seen onboard, lots of passengers feel the same way. 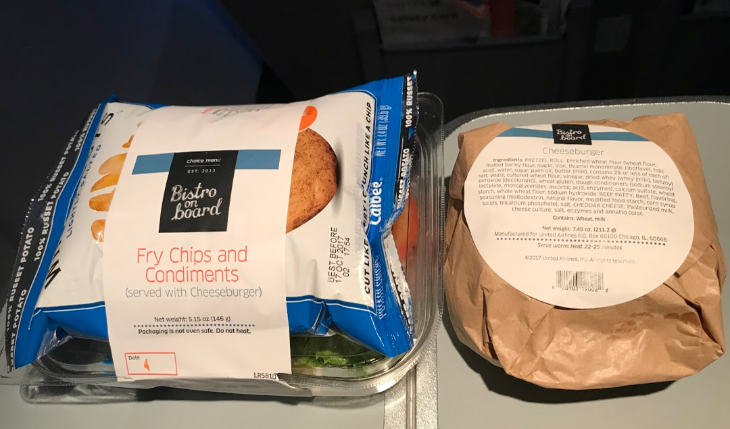 Last week on an ATL-SFO flight, I noticed that two first class passengers asked flight attendants to bring them cheeseburgers from the back of the bus—choosing the burger over their plated meals. 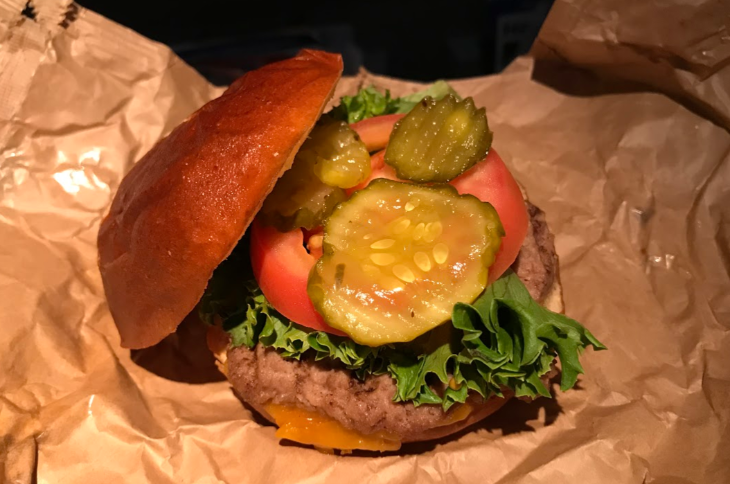 When I queried my social media streams about the burgers, most comments came back positive: “I love a good cheeseburger & compared to most plane alternatives, especially a cold option (gasp), I’ll happily devour a half-decent burger,” wrote @MilesTalk. 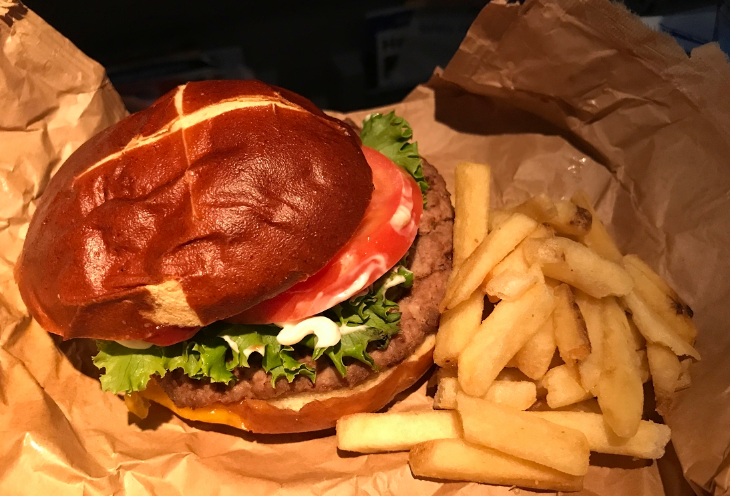 Check out the slideshow below to see how United is able to serve a hot cheeseburger in flight without it coming out a big wet mess. 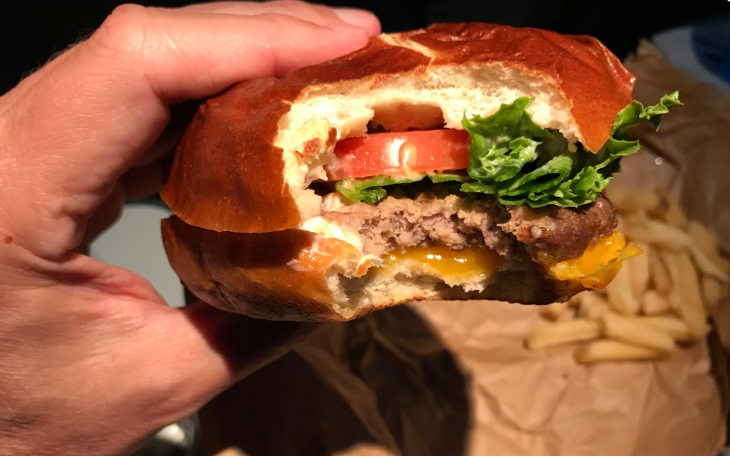 Flight attendants deliver the hot $12 cheeseburger in a brown paper wrapper. In a separate cool container, you get the lettuce, tomato, pickle, and condiments along with a bag of the fries. You also get utensils and a napkin, which is necessary because this burger is actually juicy. 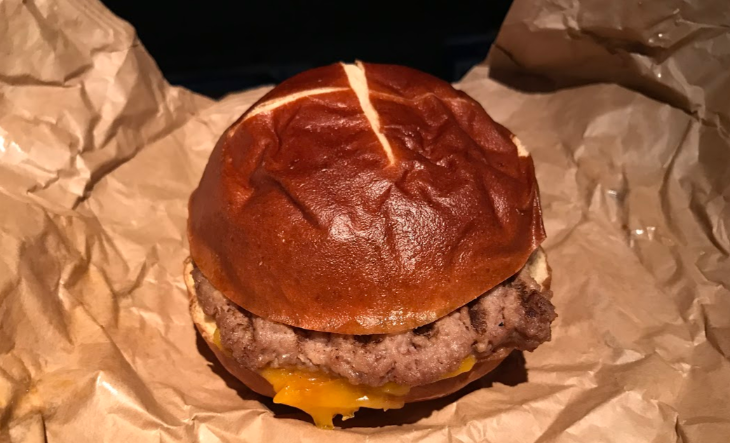 Inside the bag, the hot part of the burger is already assembled: pretzel roll (which is nice and chewy and holds up well), the beef patty (which looks like it’s been grilled, but I suspect those grill marks are fake), and the cheddar cheese, which surprisingly stays mostly in place. 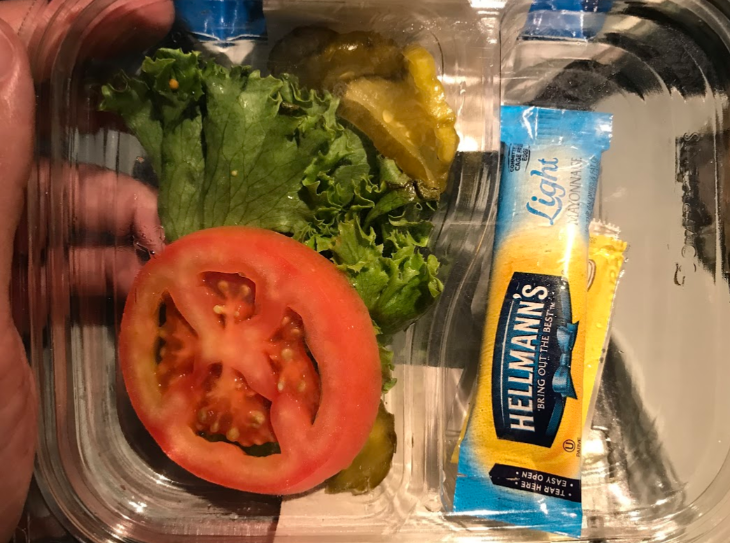 Eating a cheeseburger in economy class on United requires that you clear your entire tray table– it takes a lot of room to set this meal up. First you have to tear open the paper bag to get to it. Then use the bag as a plate since you don’t want your burger touching that nasty tray table top. The whole rigamarole might be annoying to neighbors who are not eating or who are vegan. And when all three passengers in a row get the cheeseburger, get ready to knock elbows! The top comes off easily, making room for the condiments. The bottom is pretty much glued to the patty by the cheddar cheese. Get it all dressed up, add ketchup, mustard and mayo and voila! Cheeseburger in paradise! Check out how nice those crunchy fries look next to that juicy burger! 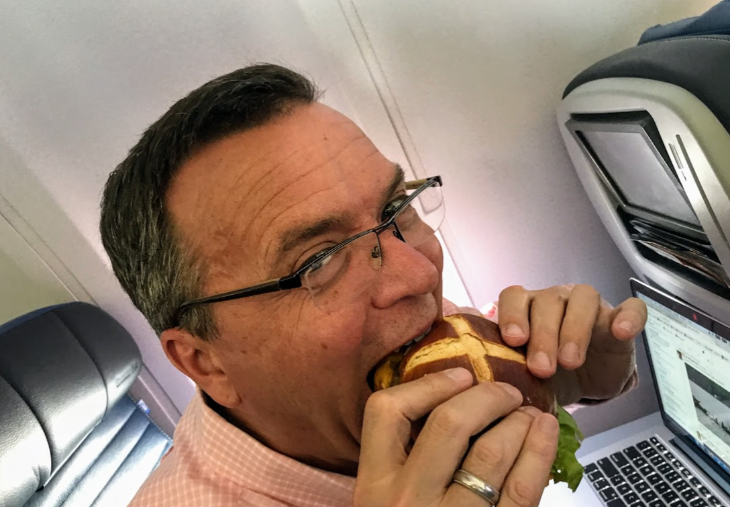 Have you had a burger in flight? Would you pay for one when flying in economy class? Please leave your comments below.